We are here! I am amazed at how great I feel after a fifteen-hour flight, the longest ever for me. Here’s my explanation- a long flight provides more uninterrupted time to sleep than a seven or eight-hour flight. We had great arrival-our luggage all made it, customs was welcoming and our smiling transfer driver was waiting for us as we entered the airport lobby. Larry, our transfer driver, shared his enthusiasm for his country as he drove us to the hotel. He told us that that there are twelve official languages in S. Africa; he speaks six of them. His step-father was a visiting lecturer in African studies at the University of Illinois. When he learned we would be here a few days, he said we could not leave without visiting Soweto. After planning a visit to Soweto for the next day and hearing from people about how unsafe it was, I was thrilled to hear his recommendation. 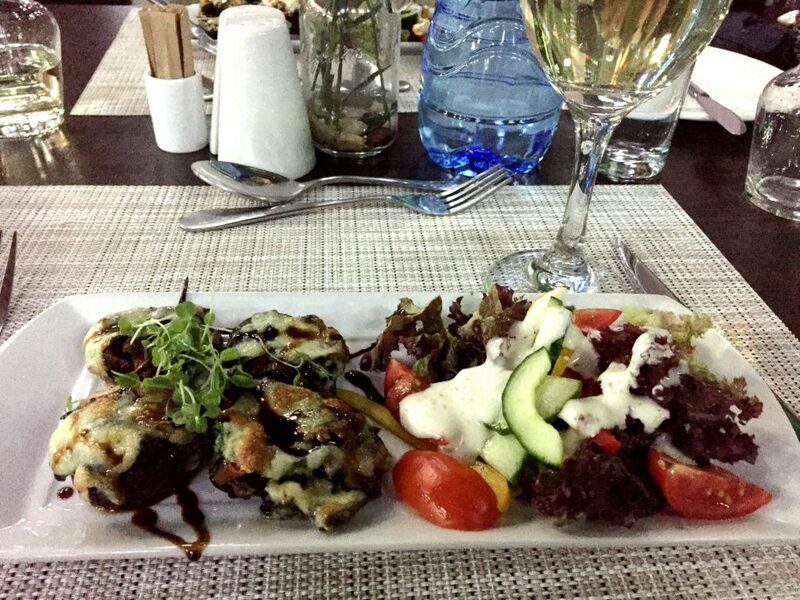 After settling in to our room, Jeanne and I had a wonderful dinner of stuffed black mushrooms and S. African wine. This entry was posted in Africa 2018 on April 23, 2018 by debbie.